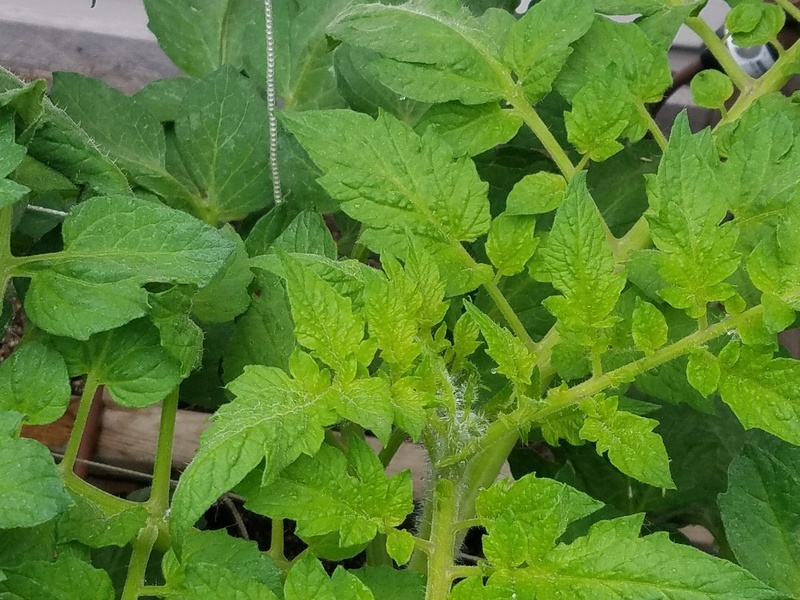 I am so excited - after a few days of high heat and humidity, my tomatoes are starting to take off. I am really pleased that my groundhog doesn't seem to have a taste for tomato plants! I see it, I see it! Look at all those green tomatoes waiting their turn. 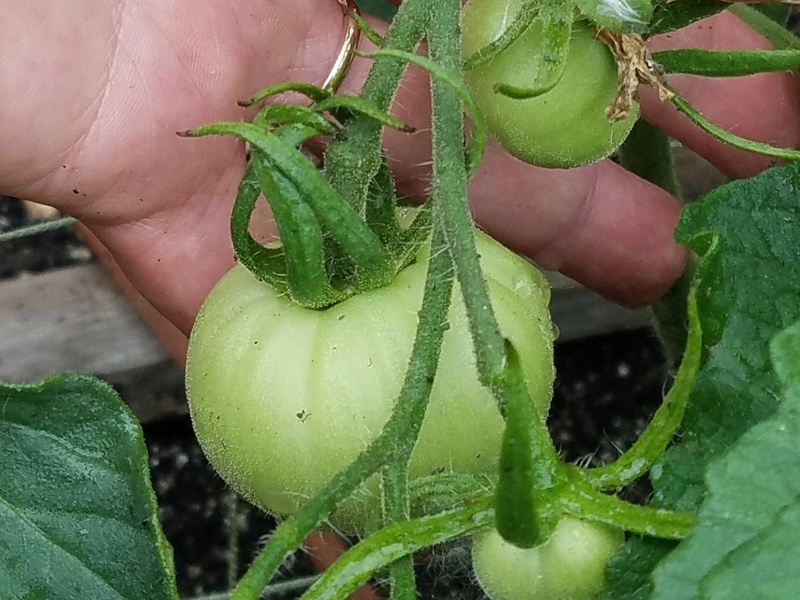 This is the first summer (6th summer) that I finally have some decent tomatoes of the varieties I have wanted, but are hard to grow here with the heat. The fruits set before this hot spell so all they had to do was ripen. It was 108*F today and overcast, not clouds, but smoke from a fire! Congratulations on a successful tomato season. @yolos wrote: Congratulations on a successful tomato season. You have worked hard for this, Congrats! This morning I blanched, chilled and peeled a full 1 gallon of juicy tomatoes. @No_Such_Reality wrote: Yesterday i was doing some cleanup around the yard and looked at my gutters under the tree that i need to trim back. What did Mother Nature do? She planted a tomato in my gutter. Its about 6 inches tall with three beautiful branches and a fourth on the way. Growing in the decomposing leaf litter only being watreed by the morning dew. I cleaned out my gutters in November before the rainy season. The tree loses most of its leaves around January. So you planted it, right???? Oh yes, transplanted to the garden and gave it a nice mulch mound from its home in the gutter. I was worried about transplant shock but it seems to be doing well. The volunteer is still alive but struggling now. It grew really well, but never set much fruit. I had two fruits something got one the other ripened and can best be described as a pointy celebrity. About the size of a celebrity tomato but the bottom had a point. The other tomatoes on the plant also pointed. Horn worms have found the plant so I'm doing battle now with them. And I suspect nematodes have caught up and the leaves are looking rough. Still have new growth that looks good though. Going to tough it out a bit longer and hope slightly cooler weather maybe sets a few fruit. First batch of roasted and crushed tomatoes in the canner. 8 pints. And there is a load of cherry tomatoes drying. 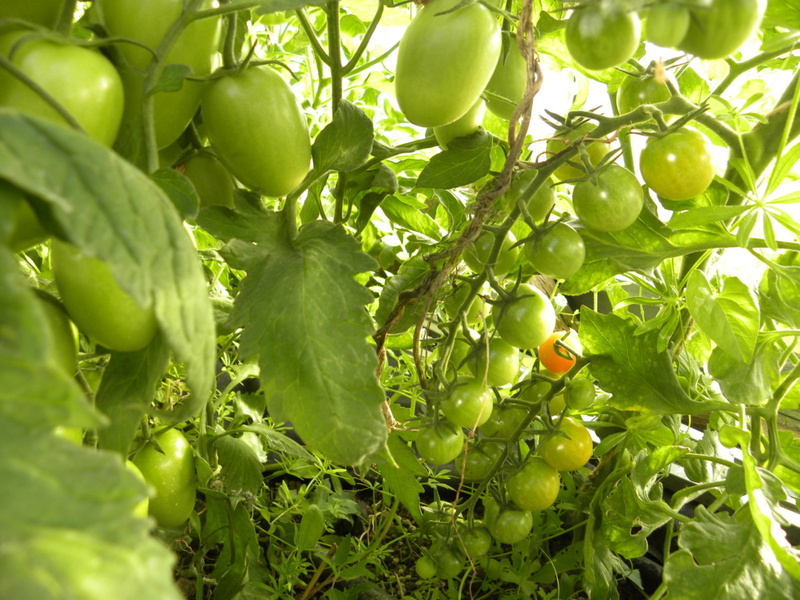 Our tomato plants are at full production now and we are harvesting more of them than we and the neighbors can use. The local food pantry gets the rest of them. NSR, With lower temps now (90's), the tomatoes are blooming again! I've been pruning the plants to get rid of new suckers and dying leaf stalks. I hope we both get a fall harvest. This evening I picked a half bushel plus a one gallon container of tomatoes from our 7 plants. This has certainly been a tomato year for us. 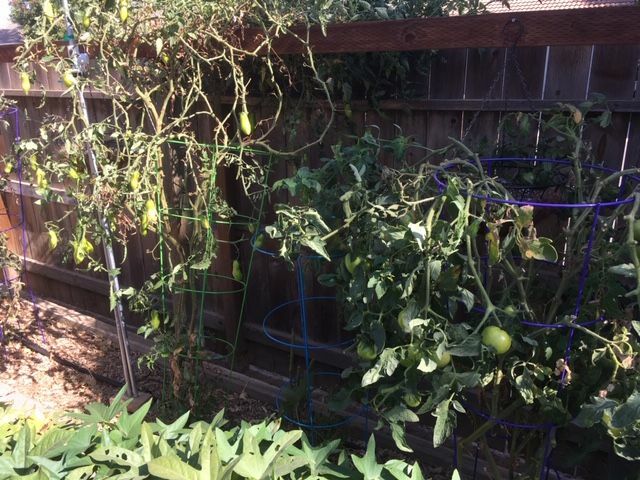 The tomatoes are still blooming and setting fruit. 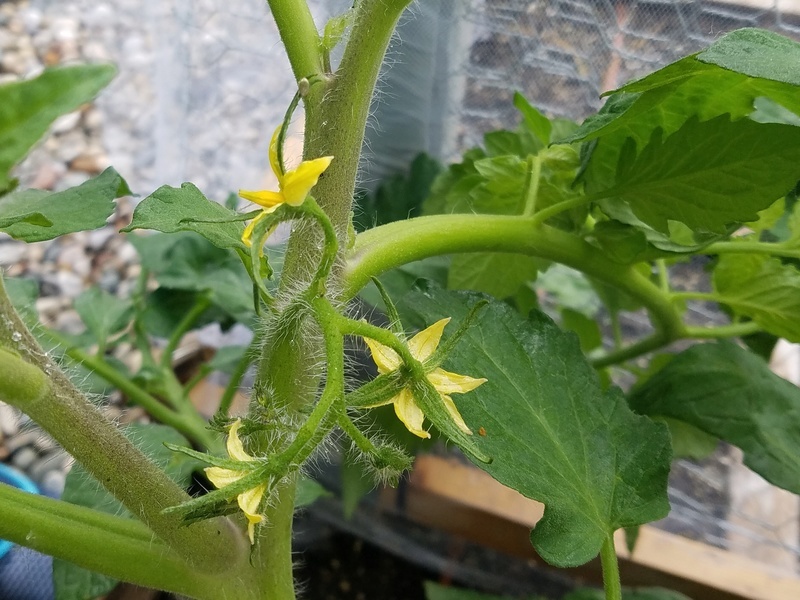 While I was picking tomatoes, the bees were very busy pollinating the new blooms on the plants. We have another about 6 weeks before the first frost, so should still be a lot of fruit on the plants. 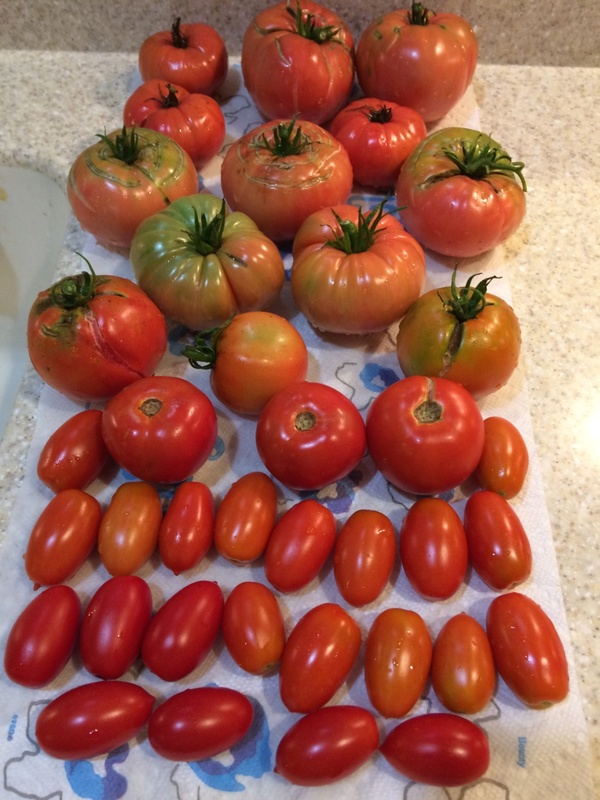 I finally pulled all of my April planted tomatoes due to my usual diseases. A couple weeks ago, I planted my second batch of tomatoes (6) in pots that used to be shaded by my live oak tree. But then I had a tree removal company (that was here removing big tall trees that were too close to the house) cut back a couple of branches on my live oak tree that were seriously shading 25% of my garden. So now the tomatoes planted in the previously shaded pots are getting full hot sun in the afternoon. But the weather is starting to moderate now so they should be able to survive and produce nicely. Well, for me it's actually tomato Thursday! After all these years of trying to grow decent-sized tomatoes and get them to ripen before the first frost, I just picked my first Cherokee Purple, which weighed in at 6.5 oz.! 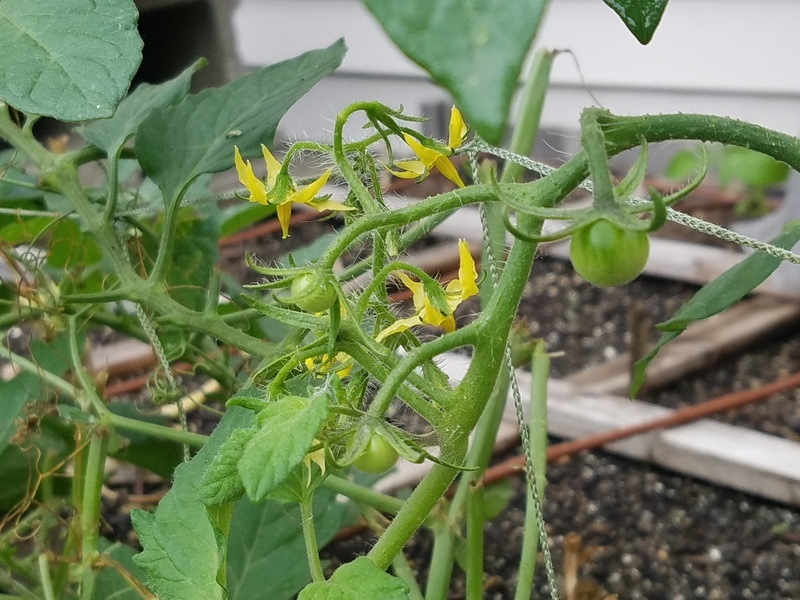 Although I've eaten five teensy, weensy ones (Champion) earlier this season, I'm hoping I can dissuade the local deer from attacking the tomatoes in the front yard. I also have Red Siberian, along with several other unlabeled varieties I started from seed. From appearances, I think that two of them are a Beefsteak variety. Since the deer don't visit often, I think that perhaps a light cover will protect my vulnerable tomato plants. I heavily pruned these plants, hoping the energy will go towards blushing or ripening. 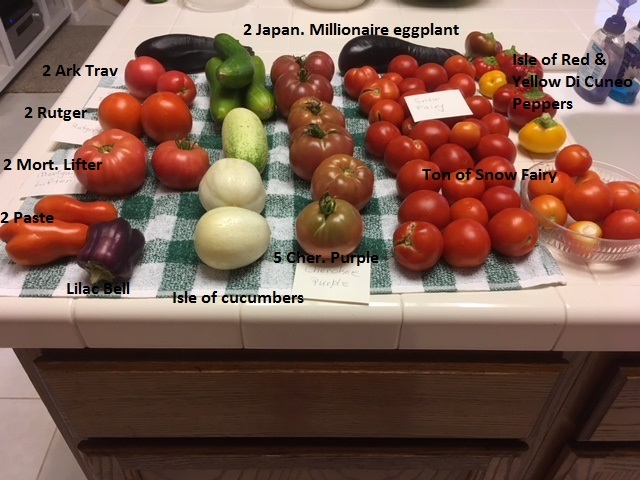 Today's harvest - Many of the big ones are split I guess because of uneven watering. Should we start a new thread for 2019 or just change the title? 1st question of the year: Do any of you save and grind egg shells to put in the holes when you're transplanting tomato plants to add calcium to the soil? If not, do you do anything else (except compost, of course)? What brand of Mycorrhizwe do you use and where do you purchase it. @yolos wrote: What brand of Mycorrhizwe do you use and where do you purchase it. I have used two different brands, and had equal success with them. One of the higher rated ones is a brand called Mykos - I used to buy it from Planet Natural, but they are going out of business and no longer have it in stock. The other brand I have used is MycoStim, which I have purchased both from Planet Natural and A.M. Leonard. I just checked A.M. Leonard's site, and they still have it, but only have 4 left in stock at the present time (they have $4.99 flat rate shipping in effect, check the posting on Vermiculite for the code to use). Here is my start for this year on pear and cherry tomatoes. These were old seeds, so I'm surprised they sprouted at all. I'm gonna get some lights on them today, since we have 3 more days of no-sun. 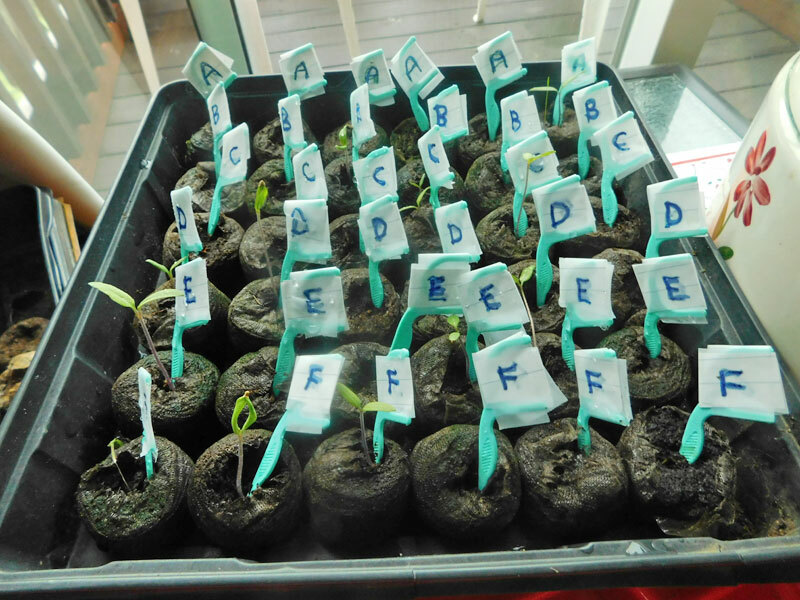 Every year I lose control of my seedlings. This year I tried yet another new system. Those are dental floss markers, with letters on the front and numbers on the back, set up like a spreadsheet -- A1, B2, etc. I added a page to Marie's spreadsheet for them. I am determined to know what they are at the end of the season, too. @Turan wrote: I seem to recall an article that showed that in places where it gets hot, really deep trenching helps the tomatoes handle the heat. I'm working my way through this thread and already found a gem. I will definitely try this. Turan. @sanderson wrote: I wrap the buckets with aluminum foil to keep the Mix cool and dark. Hi, my name is Sanderson, and I am a tomatoholic. I knit cosies for my containers. I'm modifying the pattern this year to bring it up higher around the sides to protect even more from the drying heat. (I also knit ties for my plants.) Does this mean I need that 12-step program, too? I just watched a video that said to fertilize tomato plants with molasses to improve flavor. Just add a few spoonfuls to a gallon of water and apply or spray leaves. Anybody do this? I guess it's to add potassium. This same video says to dissolve an aspirin into an 8 oz spray bottle of water and spray tomato plants to make them stronger. It sets off their defenses, somehow. If I'm getting ridiculous, here, don't be afraid to call me on it. I have always been tomato-impaired, so I'm grasping at straws. Suz, You are the most optimistic gardener. Water, thick mulch and sun shade from noon to sunset. I just want to get them through the heat until fall.